In the first division of the Book of Revelation we will see the person of Christ in His position and glory as the Great High Priest who is in charge of His church. We will see that He is in absolute control. In the Gospels we find Him to be meek, lowly, and humble. He made Himself subject to His enemies on earth and died upon a cross! We find a completely different picture of Him in the Book of the Revelation. Here He is in absolute control. Although He is still the Lamb of God, it is His wrath that is revealed, the wrath of the Lamb, and it terrifies the earth. When He speaks in wrath, His judgment begins upon the earth. 3. In His offices--High Priest (Revelation 8:3-6), Bridegroom (Revelation 19:7-9), King-Judge (Revelation 20:1-15). But while Christ is thus the central theme of the book, all of the events move toward one consummation, the bringing in of the covenanted kingdom. The key-phrase is the prophetic declaration of the "great voices in heaven" (Revelation 11:15), lit, "The world kingdom of our Lord and of his Christ has come." The book is, therefore, a prophecy (Revelation 1:3). 1. Things past, "the things thou hast seen," i.e. the Patmos vision, Revelation 1:1-20. 2. Things present, "the things which are," i.e. things then existing--obviously the churches. The temple had been destroyed, the Jews dispersed: the testimony of God had been committed to the Churches (1Timothy 3:15). Accordingly we have seven messages to seven representative churches, Revelation 2:1-3:22. It is noteworthy that the church is not mentioned in chapters 5-18. 3. Things future, "things which shall be hereafter," lit. "after these," i.e. after the church period ends, 4:1-22:21. The third major division, as Erdman (W.J.) has pointed out, falls into a series of six sevens, with parenthetical passages, making, with the church division, seven sevens. 1. The seals, Revelation 4:1-8:1. 2. The seven trumpets, Revelation 8:2-11:19. 3. The seven personages, Revelation 12:1-14, 20. 4. The seven vials (bowls), Revelation 15:1-16:21. 5. The seven dooms, Revelation 17:1-20:15. 6. The seven new things, Revelation 21:1-22:21. 1. The Jewish remnant and the tribulation saints, Revelation 7:1-17. 2. The angel, the little book, the two witnesses, Revelation 10:1-11:14. 3. The Lamb, the Remnant, and the everlasting Gospel, Revelation 14:1-13. 4. The gathering of the kings at Armageddon, Revelation 16:13-16. 5. The four alleluias in heaven, Revelation 19:1-6. These passages do not advance the prophetic narrative. Looking backward and forward they sum up results accomplished, and speak of results yet to come as if they had already come. In Revelation 14:1, for example, the Lamb and Remnant are seen prophetically on Mount Sion, though they are not actually there till Revelation 20:4-6. The end of the church period (2-3.) is left indeterminate. It will end by the fulfilment of 1 Thessalonians 4:14-17. Chapters 4-19. are believed to synchronize with Daniel's Seventieth Week ((See Scofield "Daniel 9:24). 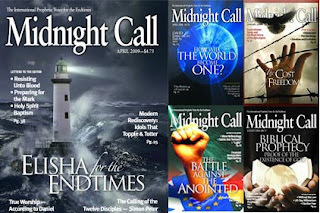 The great tribulation begins at the middle of the ") week," and continues three and a half years (Revelation 11:3-19:21). The tribulation is brought to an end by the appearing of the Lord and the battle of Armageddon (Matthew 24:29,30; Revelation 19:11-21). The kingdom follows (Revelation 20:4,5); after this the "little season" (Revelation 20:7-15), and then eternity. Interpreters of the Revelation should bear in mind two important passages: 1 Peter 1:12; 2 Peter 1:20, 21. Doubtless much which is designedly obscure to us will be clear to those for whom it was written as the time approaches. 1. The Lord Jesus Christ. He is the subject of the book. The subject is not the beasts nor the bowls of wrath but the Sin–bearer. The first mention of Him is way back in Genesis 3:15, as the Seed of the woman. 3. The resurrection and the translation of the saints (see John 14; 1 Thessalonians 4:13–18; 1 Corinthians 15:51–52). 4. The Great Tribulation, spoken of back in Deuteronomy 4 where God says that His people would be in tribulation. 5. Satan and evil (see Ezekiel 28:11–18). 6. The “man of sin” (see Ezekiel 28:1–10). 7. The course and end of apostate Christendom (see Daniel 2:31–45; Matthew 13). 8. The beginning, course, and end of the “times of the Gentiles” (see Daniel 2:37–45; Luke 21:24). The Lord Jesus said that Jerusalem will be trodden down of the Gentiles until the Times of the Gentiles are fulfilled. 9. The second coming of Christ. According to Jude 14–15, Enoch spoke of that, which takes us back to the time of the Genesis record. 1. Genesis, the book of beginning; Apocalypse, the book of the end. 2. The Earth created (Genesis 1:1); The Earth passes away (Revelation 21:1). 3. Satan’s first rebellion; Satan’s final rebellion (Revelation 20:3, 7-10). 4. Sun, Moon, and Stars, for Earth’s government (Genesis 1:14-16); Sun, Moon, and Stars, connected with Earth’s Judgment (Revelation 6:13, 8:12, 16:8). 5. Sun to govern the day (Genesis 1:16); No need of the Sun (Revelation 21:23). 6. Darkness called night (Genesis 1:5); "No night there" (Revelation 22:5). 7. Waters called seas (Genesis 1:10); "No more seas" (Revelation 21:1). 8. A river for Earth’s blessing (Genesis 2:10-14); A river for the new Earth (Revelation 22:1,2). 9. Man in God’s image (Genesis 1:26); Man headed by one in Satan’s image (Revelation 13). 10. Entrance of sin (Genesis 3); Development and end of sin (Revelation 21:22). 11. Curse pronounced (Genesis 3:14, 17); "No more curse" (Revelation 22:3). 12. Death entered (Genesis 3:19); "No more death" (Revelation 21:4). 13. Cherubim, first mentioned in connection with man (Genesis 3:24); Cherubim, finally mentioned in connection with man (4:6). 14. Man driven out from Eden (Genesis 3:24); Man restored (Revelation 22). 15. Tree of life guarded (Genesis 3:24); "Right to the Tree of Life" (Revelation 22:14). 16. Sorrow and suffering enter (Genesis 3:17); No more sorrow (21:4). 17. Man’s religion, art and science, resorted to for enjoyment, apart from God (Genesis 4); Man’s religion, luxury, art and science, in their full glory, judged and destroyed by God (Revelation 18). 18. Nimrod, a great rebel and King, and hidden Anti-God, the founder of Babylon (Genesis 10:8-9); The Beast, the great rebel, a King manifested Anti-God, the reviver of Babylon (Revelation 13:18). 19. A flood from God to destroy an evil generation (6-9); A flood from Satan to destroy an elect generation (Revelation 12). 20. The Bow, the token of God’s covenant with the Earth (Genesis 9:13,14,16); The Bow, betokening God’s remembrance of His covenant with the Earth (Revelation 4:3, 10:1). 21. Sodom and Egypt, the place of corruption and temptation (Genesis 10:19); Sodom and Egypt again: spiritually representing Jerusalem (Revelation 11:8). 22. A confederacy against Abraham’s people overthrown (Genesis 14); A confederacy against Abraham’s seed overthrown (Revelation 12). 23. Marriage of first Adam (Genesis 2:18-23); Marriage of last Adam (Revelation 19). 24. A bride sought for Abraham’s son (Isaac) and found (Genesis 24); A bride made ready and brought to Abraham’s Son (Revelation 19:9). See Matthew 1:1. 25. Two angels acting for God on behalf of His people (Genesis 19); Two witnesses acting for God on behalf of His people (Revelation 11). 26. A promised seed to possess the gate of his enemies (Genesis 22:17); The promised seed coming into possession (Revelation 11:18). 27. Man’s dominion ceased and Satan’s begun (Genesis 3:24); Satan’s dominion ended and Man’s restored (Revelation 22). 28. The old serpent causing sin, suffering and death (Genesis 3:1); The old serpent bound for 1000 years (Revelation 20:1-3). 29. The doom of the old serpent pronounced (Genesis 3:15); The doom on the old serpent executed (Revelation 20:10). 30. Sun, Moon, and Stars, associated with Israel (Genesis 37:9); Sun, Moon, and Stars, associated again with Israel (Revelation 12). Interpretive Models for the Book of Revelation as a Whole, by Greg Herrick Th.M., Ph.D.
 Studies in Revelation (38 articles in series), by J. Hampton Keathley, III, Th.M.